Have you ever thought about the quality of the human connections you make via social media? It's easy to get lost in the numbers, or to get over focused on followers, likes, shares, views, listens and the list goes on. It's easy to get lost in a sea of avatars and data insights. As marketing leaders we must remind ourselves that behind every click, share, like, view, listen and subscribe is a person, a human being. It's the humans behind the clicks and actions you want to connect with. It's the humans taking the action that will make or break your business. People buy from people. People invest in relationships with people. It's not a robot that is handing you a credit card, signing a purchase order or mailing you a check. It's a human that makes the decision to invest in you and your business. Marketers must use the data and social media insights to connect in a more human way. We should use the data to build more quality relationships and emotionally connect with the humans we want to do business with. The data can help us deep dive into factors that enable higher quality of everything including relationships. The focus should not be just on quantity of likes and followers. Success in business utilizing social media and digital marketing requires both art and science. Learning how to connect with your audience in an authentic and human way can help you stand out from the crowd, rise above the noise and build a relationship with your audience and customers that only you can do. Humanizing your brand enables you to build a relationship built on trust, authority and human connection that can be felt in the heart. The social networks such as Facebook, Twitter, and LinkedIn present a goldmine of data and insights that can help you learn about your audience, understand their behaviors and empower you to connect with your audience in a unique, relevant and human way. Earn trust with your target audience? Establish thought leadership in your industry or niche? Generate more leads and increase sales? Connect emotionally with your audience and ideal customer? Shorten the sales cycle because you establish trust and an authentic relationship faster? Ensure your audience and potential customer remembers your brand when it comes time to make a purchase decision? Speak in a way that your audience understands and relates to what you say and wants to contact you for business? Help your potential customers know that you are the right fit for their business needs? If you answered yes to the above questions then you have landed on the right blog post and podcast today. 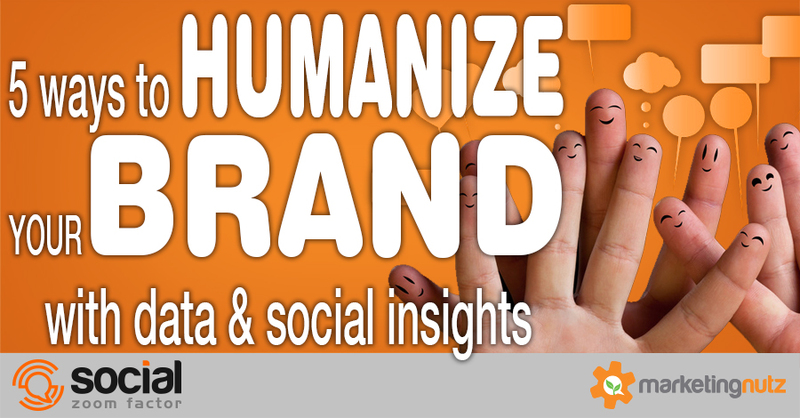 Take a listen to the 220th episode of the Social Zoom Factor podcast to learn 5 easy ways to humanize your brand utilizing data and social insights. Be sure to subscribe to our entire digital and social media marketing series on iTunes, Stitcher or SoundCloud!